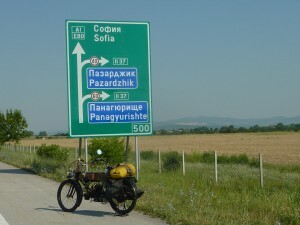 A straight forward border crossing into Bulgaria. Only about six cars going through so no queues. Also no touts or pushy money changers. Everything done in a very orderly fashion in the bank near the customs office for money changing. Best thing is that the price of petrol dropped to about half the price of Turkey’s gas and I get more for my Lev so I’ll enjoy that while it lasts! Had a great stay at Gypsy Smith’s camping & guesthouse – Villa Tikaani at Nikolovo, Bulgaria. An expat from the UK, Gypsy’s a keen motorcyclist, a lover of nature and a fantastic cook. Each morning he & I enjoyed a long walk from his home which is situated in an old tobacco producing village. A great place for visitors to relax and take in real rural life. I was fascinated to see four baby storks in a huge nest near the village & watched the mother arriving with building materials while scores of smaller birds were building nests off the bottom of stork’s home. Talk about living in harmony! For anyone into nature like me, just listening to all frog sounds, observing different bird species such as eagles, peregrine falcons and other raptors made the stay here extra special. Thanks Gypsy – you’re a good bloke and I hope lots of riders stop in and enjoy your hospitality. One real surprise here in Bulgaria has been the size of the bottle of beer. I thought I was having my leg pulled when I was offered an ale. It comes in 2.5 litre plastic bottle and yet is cheaper at only 1.6 Lev than a small can of Ozzie beer. Now that’s a serious difference ! Some maintenance on the bike meant taking out the rear wheel and adjusted the crown wheel. All is looking great, just as it was when new. I’ve been able to slowly reduce my luggage and have throw away spare petrol containers and am using only a smaller emergency oil container. By the time trip is over I’ll know exactly what it is I need to carry! I managed to find a replacement set of tyre levers for the ones that went missing with my gear. I wasn’t looking forward to changing another tyre with a plastic set as the new tyre is so strong. I’m still hunting down a tyre inflator that screws into the spark plug hole but had no luck so far. Fingers crossed I’ll get through the journey without needing it again. This country is small so it’s very easy to get from one side to the other which makes a difference to schedules which is great as I’m able to do a bit of sightseeing on my way north to Romania for the Dracula Rally in Turda. I stayed a couple of nights in Plovdiv, a fascinating old town and did something really different here, going to a concert in a roman amphitheatre – a great experience surrounded by so much ancient history. I’ve been pigging out on cherries for only 2 Lev (3 lev is 1.50), and enjoying peaches, plums and nectarines. So nice to eat fruit in season, rather than have it trucked halfway around the world and end up tasteless. When I’m not camping I’ll opt for a hotel, usually nothing flash, but just so I can shower and catch up with washing my gear. Not sure why, but I loved the name of one place I stayed – The Raisky Kat. Lynne & I met up again in Sofia. We tucked into some fig conserve she’d made in Istanbul after seeing fresh figs in the market – it brought back memories of Conondale with all our homemade preserves from the orchard. I’m really enjoying Bulgaria. Roads might not always be in as good a condition as the previous couple of countries I’ve been through but I’ve been travelling on the hard shoulder which is swept clean so have avoided any potholes. There’s a wildness about the countryside I like. In some respects it reminds me of New Zealand with the mountains, rivers and forests. And yet in other ways it’s so different with endless fields of sunflowers, freshly mown hay and donkey carts on the roads & fields, unlike anything I’ve seen up until now, and I especially enjoy the beautiful old stone bridges. Sofia the capitol has some beautiful buildings, tree lined avenues and fantastic trams that run up and down the streets every few minutes. Outdoor dining is a popular pastime, especially the Gelaterias where mountains of icecream are decorated with chocolate chips and a variety of berries and other fresh fruits. Not everyone has prospered after communism and there is obvious poverty, but there’s also a deep sense of pride as the country finds it’s feet and moves forward. We took the “Free Sofia Walking Tour” – a two plus hour walk around the city with a great young guide, who kept the group well entertained. From what I learned these walking tours are springing up all over Europe and if the one we were on is anything to go by, they’re very popular. It was fascinating to see how unearthed Roman ruins in the underground have been preserved, with a new rail line being diverted in order that nothing of historical value is lost. Walking on the smooth cobbled roadway under the present main street, picturing what life must have been like back in Roman times is kind of exhilarating. Speaking of cobbled streets, they’re a bugger to negotiate on the FN, but I’ll need to get used to them as we make our way across Europe. I remember steep cobbled streets from Mexico all those years ago and they’re even harder to navigate now than when I was riding back then on a much bigger bike. On my own again, the ride from Sofia to Veliko Tarnovo, the old capitol of Bulgaria was pleasant. Effie is managing the hills well and we’re setting off early in the mornings in the cool before the heat gets too bad. I’ve met a few riders along the way, certainly not as many as I expected, though that may change as I get further west. I see the odd bike with European number plates, but most people only have a few weeks holiday, so no time for them to stop and chat. Me, I can bop along at a snail’s pace, enjoy the scenery and listen to the hum of a happy engine. What more could an old bloke want? What an “Incredible Ride/Adventure” that only you 2 could pull off, but nothing surprising since I first met you both at Wing Ding 1980 in AZ on your 3 year adventure on the 76 LTD.
Deal, make sure you get contact details from Adrian. Also make sure that Adrian doesn’t get you entered into the bike races in Turda! The whole town shuts it’s streets for the occasion, I think you will qualify for classic status, comfortably. Poor Adrian is pretty stuffed with all the pushing he’s had to do over the past few days. I don’t think buying an FN is on the top of his list right now. LOL He’s a good bloke and he did make the journey over the Fagaras Mountains easier, that’s for sure – what a ride it was! Hoping to see a few bikes here in Turda. Way to go, Ron! I’ve been following your incredible adventure since someone kindly put up a link to your site on the HUBB Ride Tales board! You’re an inspiration to get up off the davenport, switch off the telly and start living life. All the best to you and Lynne! It’s great to have you following the blog. Thanks for your all your good wishes. Adrian rode out of Veliko Tarnovo with me and jokingly said he’d never noticed so much of the road before! LOL It looks like it’ll be a lot of fun riding to Turda together. You’re right, he is a special person. I hear you guys might be heading to India next year? If I make it to England in Nov maybe we can meet up and share a pint. Thanks for stopping by. As I read your blog I see that you are being well looked after by people on the road and those that you been in contact with through your blog. I wish you all the best in your race and I am sure Effie will do her best. Love to you and Lynne and congratulations to Effie on her determination to see this trip to the end. Yes, people have been fantastic where ever I’ve been. 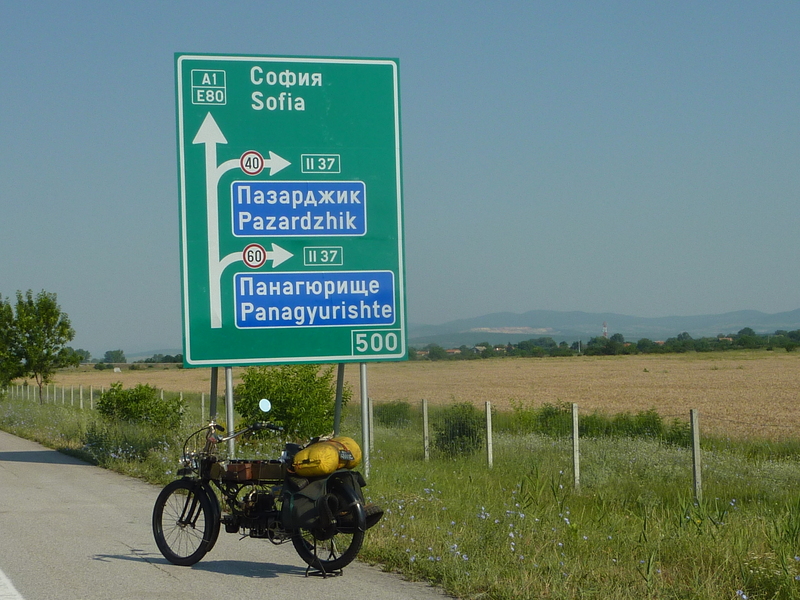 Just yesterday a guy was waiting at the ferry for me – he’d been following the blog & decided to welcome me to Romania. Makes you feel pretty humble to know so many people are interested in what I’m doing. I think there is a race at the Dracula Rally but not sure Effie would be up to it! LOL I’m just there to share a good weekend with fellow riders, check out all the bikes and enjoy a nice part of Romania. Fingers crossed for good weather. Hi Ron, we only met on Saturday, I think it’s wonderful what you are doing – you are an inspiration ! Lovely reading your blog, you should write for the Bulgarian Tourist Board! So glad you are enjoying Bulgaria. There are lots of surprises here! PS – I like it that your bike has a name – do all bikers name their bikes?!! Nice story, read it quick like always, but I will take a print off and read with a fine glass of beer. I’ve just take your small present for on Effie this mooring, it’s something special that will suit here brass fuel tank. I must urgent send a update to some magazine so they knows where your hanging around for this moment, will do also a mailing to member. Will try to bring you in contact with Waldamnn the big FN collector in Austria and send a other update to Herstal. Fingers crossed perhaps so of the bosses will(?) come to Bernkastel, we are now working on the political way. After Bernkastel you trip went to Herstal-Brussel is there a way to come to my town called Bruges, there will be then a local group of FN and other motorcycle owners to welcome you. FN greetings from Jacques PS: so Dear Ron The meeting point for us both( and a lot of others) is coming nearly = Germany 10 the FN meeting. Saw the Danube for the first time yesterday – what a sight for sore eyes! Means I’m getting close to your corner of the world. Will definitely be visiting Bruges and sharing a beer with you. Thanks for all the work you’re doing contacting everyone and I hope you get good support for Bernkastel. You’re a great bloke. Great to meet you too. My ‘secretary’ translates my daily reports into something legible. That way I can get on with the serious work of having fun! Effie is for FN (Fabrique Nationale). Not sure about all riders naming their bikes, some I know do. Talking to her helps pass the time & keeps me sane or means I’ve been on the road too long! Hope you’ve got some good adventures planned to help those itchy feet. The rally will be fun and looking forward to seeing lots of bikes from all over – a real boy’s weekend. Where ever you are just enjoy your journey and get your dream. Thanks for the good wishes. There have been some tough days but it’s been fun too. Love to you and Made. I’m amazed. Effie looks 100% better than she should, knowing everything she (and you) have been through. They (you..) just don’t build them like that anymore. Effie doesn’t look as good as she did when we started but she’s not in bad shape all things considered. She and I may have some challenges still ahead but nothing we can’t both handle.